As if things weren’t bad enough in Australia, now there’s this: the Dutch Disease. No, it isn’t a fungus spread when you plant tulip bulbs in the vineyard or something you saw on the television series House MD. It’s much more serious than that. And it’s hitting South Africa, too. Look out! I’ve written several times about Australia’s continuing wine crisis. It seems like everything that could go wrong has gone wrong. Too much heat, too little water, excess capacity, collapsing demand — even smoke-tainted grapes caused by runaway brush fires. Yikes! Now there is more bad news and it’s the result of too much good news? Good news is bad news? Yes. Read on. The Dutch Disease is the name economists give to the problem of too much good news in one industry and its negative impact on the rest of the economy. If one sector of the economy gets hot on global markets (think oil exports, for example) one effect can be that export sales increase the demand for the country’s currency, causing it to appreciate in real terms. The rising currency value makes all the nation’s other products more expensive on foreign markets, sending them into a tail-spin. That’s how good news in one part of the economy can backfire. The Economist magazine apparently invented the term to describe the dilemma of the Netherlands after a big gas field was found there in 1959. The good news / bad news in Australia is clearly the fact that China’s economy is growing rapidly and sucking in the natural resources that Australia has in considerable abundance. But big purchases of the Australian dollar needed to pay for these products has pushed the currency up, making Australian wines more expensive here in the U.S. This helps explain why off-premises sales of Australian wines are still falling here even though many other segments of the wine market are recovering. Recent Nielsen retail data show the U.S. wine market growing by 4.3 percent in the period ending in August, but sales of Australian wine fell by 7.5 percent (data from the November issue of Wine Business Monthly). As the chart above shows, the Australian dollar has continued to appreciate since these data were compiled, magnifying both the Dutch Disease problem and the sense of crisis in the Australian wine industry. South Africa seems to be experiencing the Dutch Disease as well. There are many factors that have contributed to the sharp rise of the Rand against the dollar, but surely the surge in gold prices must be the most important one. As speculators and investors who have worried about inflation turn to gold, their purchases have driven up the value of South Africa’s currency as well. 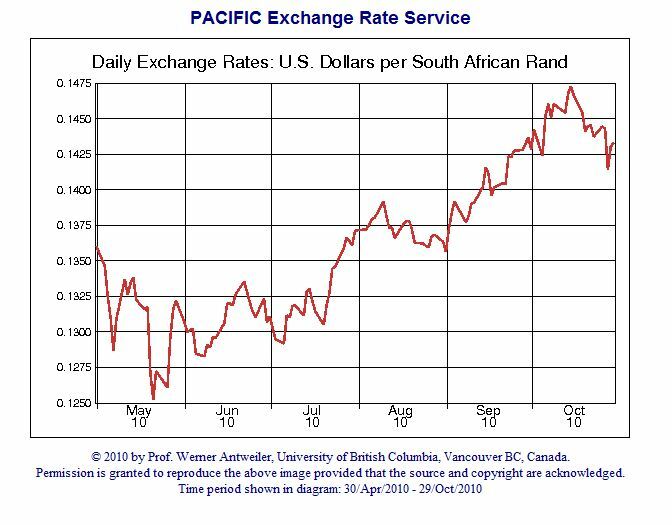 This helps explain why sales of South African wine in the U.S. have been in a bad slump. Nielsen data indicate that South African wine sales fell by 8.3 percent in August and by 9.4 percent in the last year. The U.S. dollar’s rapid recent fall will affect all countries that depend on our huge markets for exports, but inevitably some will be hit more than others. Those like Australian and South Africa who suffer the Dutch Disease will be challenged the most. We’ve entered an era of extremely unstable currencies, reflecting both the inherent instability of international financial flows and the increasingly cut-throat battles in the global currency wars. Inevitably many industries — including wine — will get caught in the cross-fire. FX Charts © 2010 by Werner Antweiler, University of British Columbia. All rights reserved. 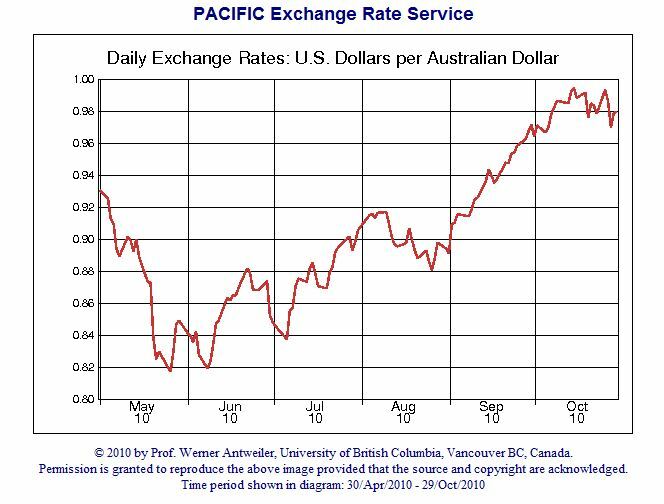 The Pacific Exchange Rate Service is located in Vancouver, Canada.